Venetoclax (VEN) is a selective, potent, orally bioavailable BCL-2 inhibitor. High overall response rates (ORR, 79%) and complete response rates (CR, 20%) were attained in a first-in-human dose-escalation study (M12-175) of VEN monotherapy in patients (pts) with relapsed/refractory (R/R) chronic lymphocytic leukaemia (CLL) or small lymphocytic lymphoma (SLL). The addition of monthly rituximab (R; months 1 – 6) in combination with VEN is being evaluated in an ongoing phase 1b dose-escalation study (M13-365) and as of 28Oct2015, the observed ORR is 86% and the CR rate is 47%. Entry criteria for the two studies were similar, but distribution of pt demographic and disease characteristics differed. To assess the effect of adding R to VEN on response rate as well as on the quality and duration of the response, relative to VEN monotherapy using post hoc exploratory multivariable analyses. Analyses used a cutoff of 25Aug2015 for M12-175 and 28Oct2015 for M13-365. The median follow-up was 17 and 21 months for M12-175 and M13-365, respectively. Demographic and disease characteristics were analyzed if their distribution differed between the studies and/or they had been identified as VEN response-modifiers in prior exploratory analyses (Roberts et al, NEJM 2016). Included variables were: age, number of prior therapies received (<3 vs ≥3), maximum lymph node diameter (≤5 vs >5 cm), 17p status by FISH (not deleted vs deleted), and VEN dose (evaluated using assigned dose cohort in each study: 400 vs <400 mg [150, 200, 300 mg] or >400 mg [500, 600, 800 mg]). Pt inclusion required available data for all variables analyzed. Forward stepwise selection was applied for the model, starting with therapy (VEN plus R vs VEN monotherapy); a significance threshold of p<0.2 was used to add or remove variables to/from the model. Logistic regression analyses were performed for ORR (responder vs non-responder) and CR (CR/CRi vs all other pts). A Cox proportional hazards model was applied to evaluate differences in duration of response (DoR). Final models from stepwise regression analyses are summarized in the table. Following selection of the final model, 157 pts were evaluated for ORR (84, M12-175; 45, M13-365), 156 for CR (83, M12-175; 45, M13-365), and 105 for DoR (66, M12-175; 39, M13-365). Combination therapy did not influence ORR relative to VEN monotherapy (odds ratio: 1.142 [95% CI: 0.433 – 3.015]; p=0.79). 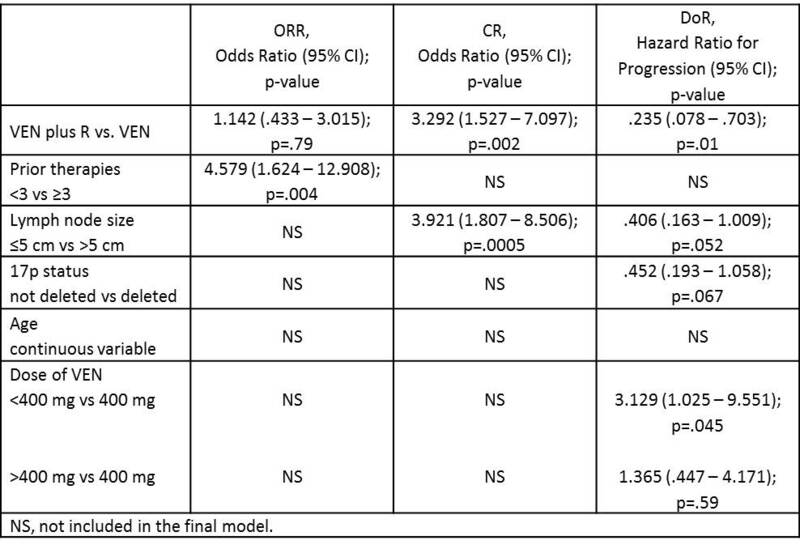 Responses of CR/CRi were more likely with combination therapy (odds ratio: 3.292 [95% CI: 1.527 – 7.097]; p=0.002) and they were more durable, with longer DoR with combination versus VEN monotherapy (hazard ratio for progression: 0.235 [95% CI: 0.078 – 0.703]; p=0.01).When analyzed across both studies, pts who received <3 prior therapies were more likely to achieve a response. Confirming prior exploratory analyses, pts with maximum nodal diameter ≤5 cm were more likely to achieve CR. Pts receiving <400 mg VEN (400 mg is the phase 2 dose of VEN combined with R or monotherapy) had shorter DoR. The effects of other variables were not significant. Results of these exploratory, cross-study, post hoc analyses support the choice of 400 mg VEN dosing and indicate higher CR rates and longer DoR with the combination of VEN plus R after adjusting for pt demographics and disease characteristics. VEN combined with R is currently being evaluated in the ongoing, phase 3 MURANO study randomized against bendamustine with R.